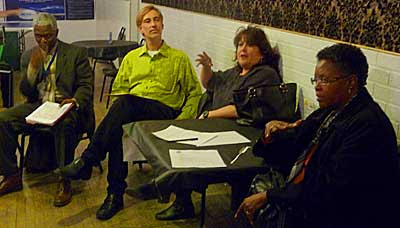 Public-affairs officer Mark Reynolds (from left) and East Village Association president John Scheer listen to postal real-estate specialist Susan Bourgart and customer-service manager Gerrie Barnett-Campbell. The Division Street post office will be packing up when its 50-year lease runs out Aug. 31. The retail location likely will move within a few blocks, Chicago area postal executives told East Village Association members on April 6, but the rest of the operation at 1635 W. Division could go elsewhere. Negotiations with the current landlord are at an impasse. Real-estate specialist Susan Bourgart said rehabbing another building will take two or three months, so the post office is under the gun to find new spaces this spring. With rent at the current location likely to triple, "it's 90% likely we probably will not stay there," Bourgart said. Customer-service manager Gerrie Barnett-Campbell said the quick move will not disrupt service. But residents in attendance pressed the postal executives to do better. "I'm hoping the new facility leads to higher levels of service and accuracy," said EVA vice president Greg Nagel. When Nagel called the station the worst in Chicago, operations manager Keith Pugh assured him that service was improving  and at least one unnamed city post office was worse. New York transplant Barnett-Campbell admitted that the 60622 station has gone through several managers in the past year. "We're not trying to get just anybody," she said, "we're looking for a good fit." Meanwhile, absenteeism is a persistent issue "like any other business."